It is a surgical operation which is done to save the viability of any limb affected. In this operation a part or full limb is cut off from the body to save the patient. This operation is done as a result of worse injury, severe infection and when the blood supply to the limb is minimum that it cannot work out properly. The main purpose behind this surgical procedure is to remove the effected cells so that it cannot effect whole limb and limb starts healing to its normal state and to maintain the normal functioning of limb. 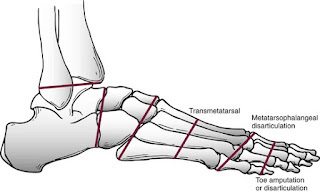 Trans metatarsal amputation is recommended for patients with chronic ulceration at the limb (mostly seen in foot), if gangrene appears on the limb which may be multiple, if the patient is suffering from both of the above mentioned problems along with diabetes and when severe injury occur on limb. Trans metatarsal amputation is not recommended for patients with cellulitis and lymphangitis. During this surgical operation, an IV is injected side by side to provide continuous medication or fluids. Anesthesia is given locally (spinal or epidural) or general depending on patient’s condition. Then deep incision is made and cut the affected part off and bandaged. 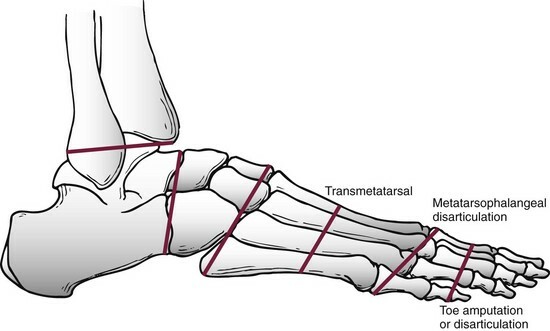 Rehabilitation from trans metatarsal amputation at the edge of affected area is seldom a success. A study shows that only 5 % of patients recover and start to move with the use of prosthesis, and be able to use wheel chair within 5 years. Research says that, the percentage of rehabilitation should be increase from 5 %. Recovery speed after Trans metatarsal amputation is speedy as compare to recovery after BKA or AKA. There is very less or no mortality rate associated with Trans metatarsal amputation. The recovery from Trans metatarsal amputation is fast as compare to other surgical procedures. Patient have to do exercises and take proper rest. Patient should not move without the help of health care provider. If patient on standing feel weakness then he should immediately sit or lie down on bed. Many devices are also introduced to help the patient to move and take part in regular activities of life. The patient should not eat or drink right after the surgical operation as this can induce vomiting in patient. So, patient should start with light diet. As the most common cause reported behind this surgical operation is the injury in diabetic patient. 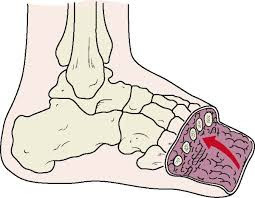 Injury most commonly occur on foot and toes. Study reveals that about 25% of patients have ulcer at their foot and go through Trans metatarsal amputation. If the toes are removed during surgery, the devices made of foam are attached at the site of toes so that the shoe can be filled and the pressure can redistribute evenly. These devices are known as below-ankle. Devices which covers the leg along with foot are known as above-ankle.